It’s been a while since photographer Mario Reyes and I have done a Rafu roadtrip. But that’s where we were on a recent Friday afternoon, cruising up Highway 99 to cover the Nisei graduation at Washington Union High School in the farming community of Easton. It’s a route I’m fairly familiar with. My late Uncle Pancho and Auntie Yo Kosaka lived up in Lodi, so we’d head up the 99 to visit. The effects of drought weren’t immediately visible judging by the leafy rows of almond trees and grape vines we saw on the way up. But placards and billboards dotting the highway alluded to the drought and the importance of water to the local economy. We were fortunate to stay with Marion and Sab Masada, friends of Maggie’s who graciously opened up their home and treated us to breakfast, including a chilled soup made of fresh zucchini. It was a shame we couldn’t stay a little longer because the Masadas wanted to show us some of the important Japanese American historic sites such as the memorials built to commemorate assembly centers at the Fresno Fairgrounds and at Pinedale. In the morning as we left Fresno, the Masadas took us to Simonian Farms, where owner Dennis Simonian has constructed a remarkable tribute to five Japanese American farming families he credits with teaching him the values of hard work and honesty. There is commonality in the struggle of immigrants and Simonian, who is Armenian, found mentors within the Japanese American farming community. Visitors walk inside the structure where the wooden walls surround you. I felt the aged wood and wondered whether it was once part of a barrack where a Japanese American family once lived. 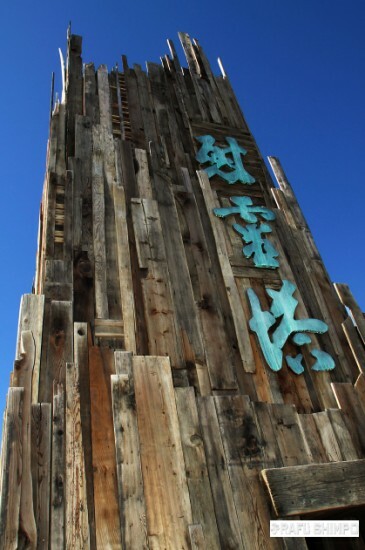 Looking up, the view within the wooden tower opens to blue sky, a message of hope. Located at 2629 S. Clovis Ave. in Fresno, it’s definitely worth a trip. Back here in Little Tokyo, we have our iconic fire tower at Japanese Village Plaza, but much else in the surrounding area is rapidly changing. Construction on the Regional Connector has begun, as anybody who has driven on Alameda these days can attest. Only in J-Town can you be sentimental about a parking lot, yet that’s how I felt as I walked through the Señor Fish parking lot one last time this week. Señor Fish, Spice Table and Weiland Brewing Company have long ago closed and the windows boarded up. It’s a mini ghost town set amid the downtown hustle and bustle. Everywhere there now seems to be new construction, most notably the Regional Connector and AVA Little Tokyo on Los Angeles Street, across from the Little Tokyo Branch Public Library. Closer to our office on Alameda, the Little Tokyo Galleria is getting a facelift, its façade covered while it is under construction. At Señor Fish, Mario did something I wish that I had thought of. After taking photos, he took a cutting from the cactus growing in the back of the abandoned restaurant. In time the plant will be a living testament to what once was. Anyone wanting to survey the changes in Japanese Americans names would want to pick up the annual Rafu graduation issue. For the past 60 years, Rafu staff has been chronicling the names of graduates. Where George, Shigeru and Mary may have been commonplace decades ago, today it is names like Kylie, Connor, Noah and Ashley. In another 18 years or so, will there be an Elsa or two in that issue? According to BabyCentre, a popular baby name website, Elsa, the name of the snow queen in Disney’s “Frozen,” has joined the top 100 for girls’ names for the first time this year. I think the first time I realized what a phenomenon “Frozen” had become was when I heard some JA kids, still wearing their basketball jerseys, singing music from “Frozen” at the Loft one night. Judging by the parents’ expressions, they had probably heard it about a couple thousand times already. “Let it go?” Not these kids. **Gwen Muranaka is the English editor-in-chief of The Rafu Shimpo and can be reached at [email protected] Ochazuke is a staff-written column. Opinions expressed are not necessarily those of The Rafu Shimpo.